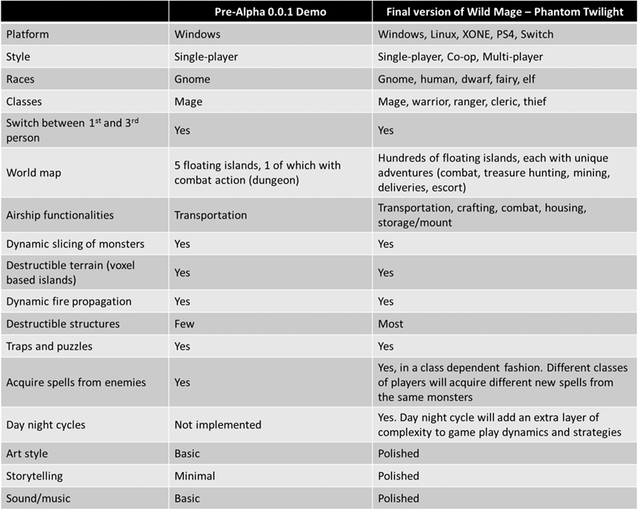 Wild Mage - Phantom Twilight is an open-world action/adventure RPG featuring airships, floating islands, dungeons and next-gen combat. With no traditional leveling, new skills are acquired via monsters and lore. Voxel-based islands can be tunneled & show destruction. Monsters can be sliced into pieces and can alo destroy the environment around them. Wield powerful magic but also face hoards of monsters. Post news Report RSS	Pre-Alpha 0.0.1 Kickstarter Demo Available for Download! Hi everyone! Our first demo is now released and available for download through the remainder of our Kickstarter campaign! Check it out and let us know what you think! As we mentioned in the previous update, this is a first demo focusing on gameplay mechanics and unique selling points, and it's Windows only. The difference between the Demo and the final game is summarized below. If you like it and see potential in this game, there's still time to support our campaign! Make a pledge, tell a friend, share on social media! We look forward to and appreciate any constructive feedback! Please contact us at Lucas@lunaorion.com.